My love of hip hop has waned in the last few years as I’ve been slowly transitioning into an old man that hates all music that I heard after high school. Games hardly play to my picky hip hop tastes which is why I was surprised when I heard what Desert Child‘s beats had to offer. I was even more more shocked when I saw it was a racing RPG—two genres I hardly give a second glance to. 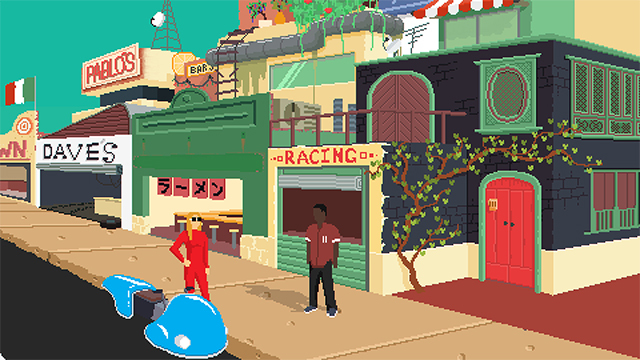 But, from what I played and saw, Desert Child is a weird blend of hoverbikes, role playing mechanics, and rap that I want to see more of. Or, perhaps more accurately, hear more of. Desert Child’s soundtrack evokes an old school hip hop discography’s worth of smooth beats that I immediately wanted a mixtape of. Artists like the Mega Man mega fan Mega Ran, Girlfriend Material, and the sole developer Oscar Brittain himself make up the lo-fi beats in the soundtrack. These sounds are meant to evoke and old school feel reminiscent of the Wu-Tang Clan, Central Parks, Eevee (not the Pokemon), and more. CEO of publisher Akupara Games David Logan described how that was exactly the vibe Brittain wanted when creating the soundtrack. The sound of the songs might make you nod your head to the beat but the tone of the tunes might be a little bit more heavy when taking account of the game as a whole. You play as a young man in the year 2071 as he tries to race to earn money to escape the nearly uninhabitable Earth by buying a ticket to Mars. With a tight budget and a nonexistent social circle, you have to make it through in a strange new place with barely a leg to stand on and no backup plan. This gives the lo-fi beats a more depressing, if still funky, mood since it’s paired with a story about going out on your own and surviving. Moving out for the first time is a tough event most people have to go through as they grow up, which is also something Brittain was trying to achieve in the game. Its RPG mechanics seem to reflect that sense of constant budgeting and decision making. The protagonist earns money by racing, but also through odd jobs such as herding kangaroos and delivering pizza. But you have to constantly spend money to make money, which is an essential factor in a good video game economy. Much like real life, food is a constant financial drain and you have to choose between filling your stomach, buying music, or tricking out your bike to make it run harder, better, faster, and stronger. Stealing some bike parts is also possible and that also further lent to the main character’s desperation. Since the bike is your moneymaker, it’ll be interesting to see how heavily and how often the game’s economy pushes you to make tough decisions between you and your bike. However, it didn’t seem like there was any morality system or punishment for working outside the law to make ends meet. 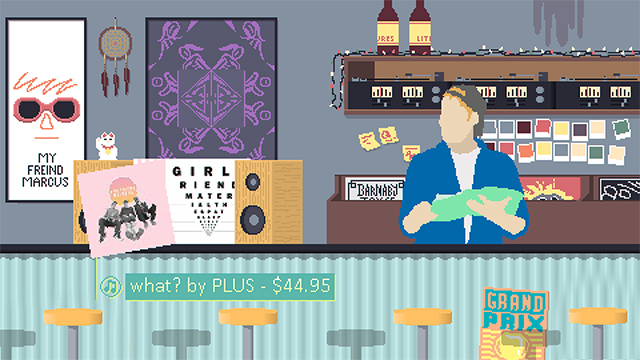 Judging the scope of the RPG systems is tough in a short demo, but, if it comes together, it could be a poignant and possibly too real twist on the typical choice-driven RPGs. Logan said he hopes as much. The RPG portion takes place in an simulacrum of Brittain’s home country, Australia. While he is not recreating a one-to-one digital representation of it, many of the game’s locales are pixel art version of buildings around Brittain’s town. He even went out to local areas to make sketches that served as inspiration for some of Desert Child’s environments. But, being only an inspiration, it gives the game a chance to add objects like giant robots and other structures that give it its own personality. 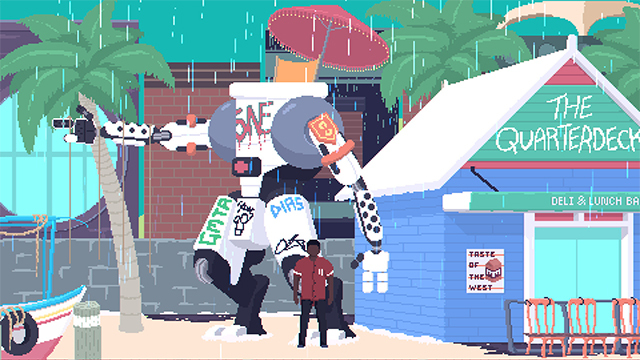 The town seemed initially small in scope but the pretty pixel art and overall chill atmosphere make it look like a decent, if limited, place to explore. 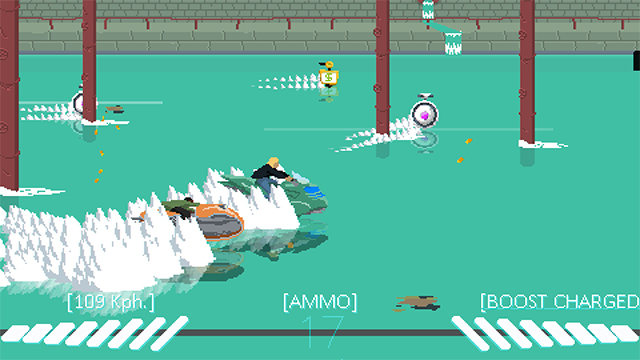 Hoverbike racing brings in the choices you made in the RPG sections and is where the game gets its high octane thrills. It’s not an overheard view, but shot from the side and has you weaving through different environmental hazards while also shooting at its barrage of targets. Racing takes a little bit to get used to since the unique perspective and twitchy controls can easily send you careening into obstacles. The lack of depth perception can also mess you up since it makes it difficult to discern whether or not you’ll hit an object or barely skim right past it. Even though it seems like a racing game first and foremost (and was designed as such), these bits gave me a bit of trouble. However, according to Logan, it’s a skill-based game that opens up as you learn how it moves and stack up upgrades. Knowing when to shoot, dodge, and boost become an integral part of the gameplay loop, one that isn’t going to fully expose itself in only a few matches of play. The controls were responsive enough to give credence to Logan’s claim and I did enjoy myself more in every successive race as I continued to figure out more of its systems. But seeing potential and seeing results are two different things that can only actualize in the final, complete game. Desert Child knew how to appeal to my hip hop tastes but it also made a decent attempt at trying to get me to love its two gameplay pillars. While it may take place over 50 years in the future with the appropriate technology, the struggle of managing money and barely scraping by seemed like a good realistic anchor to build the game around. Its racing mechanics also may not have fully opened up during my demo, but its responsive controls give me some hope that it will improve over time. I’ll only truly get to test whether or not its racing mechanics and unique role-playing gameplay blend together nicely when it comes out on December 11.